Join us 6-8 p.m. Thursday (March 15) at the West Hawaii Civic Center for the latest Community Forum featuring an informative session about active shooter awareness, preparedness, and response. 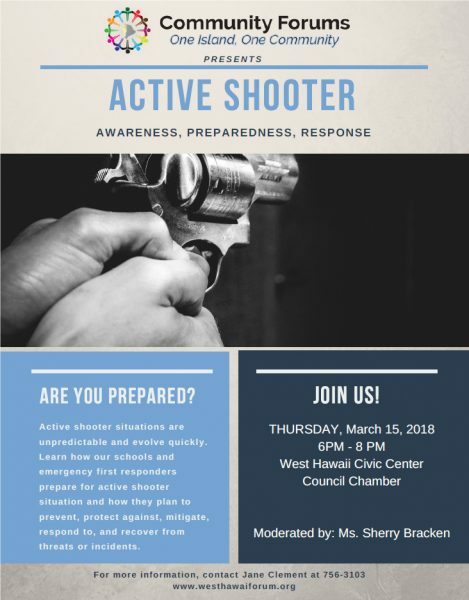 This session will feature Lt. Thomas Shopay (Hawaii Police Department), Shawn Suzuki (Konawaena High School principal) and John Yates (Walmart General Manager). Lt. Thomas Shopay is a Kona resident and has worked for the Hawaii Police Department for over 18 years. The majority of that time was spent with the Special Response Team (SRT), based out of Hilo. Lt. Shopay participated with SRT initially as a team member, was promoted to Team Sergeant and later promoted to Tactical Commander. Lt. Shopay recently transferred to Kona Patrol as a shift commander to further his experience and be closer to home. Lt. Shopay is a recipient of the Hawaii Police Department Silver Medal of Valor and is a graduate of the FBI National Academy in Quantico, Virginia.